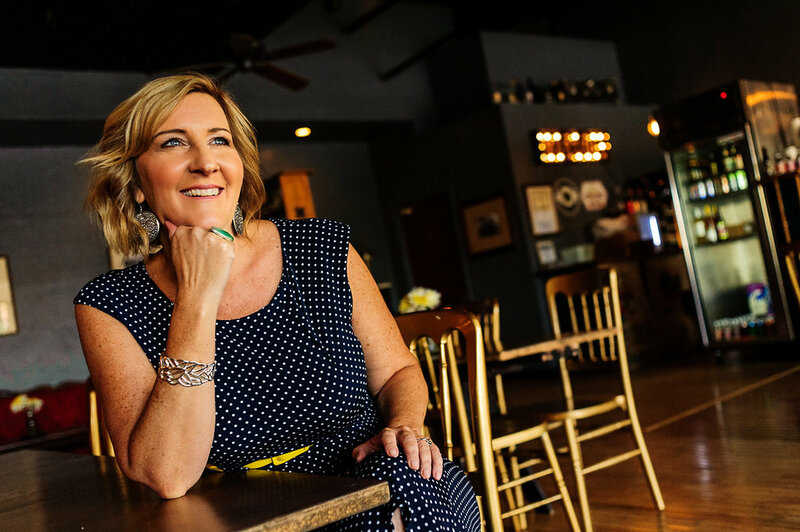 Author, speaker and business coach Pamela Slim is opening a new space to grow small businesses in downtown Mesa. 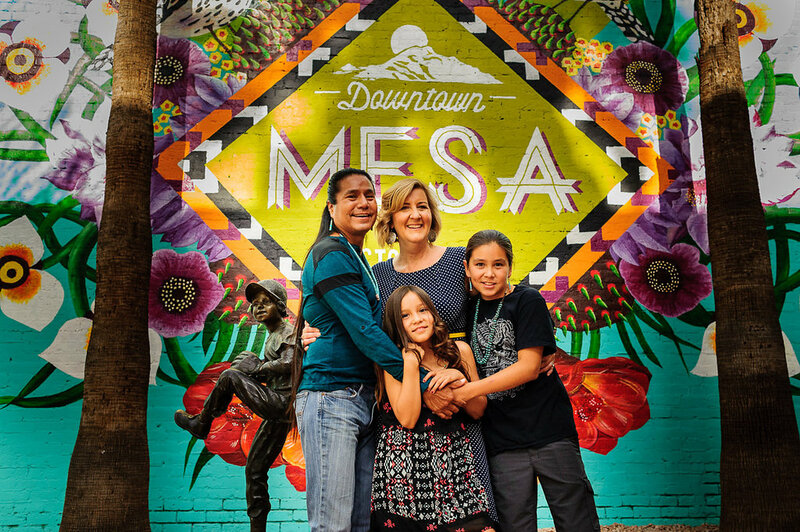 Her goal is to support the creative and small business renaissance happening in downtown Mesa, and grow the strength and capacity of local business owners. K'é will offer a wide variety of classes and programs, from regular free classes, to year-long paid mentoring programs. Pam and her family in downtown Mesa. Photo by Kelly and Sergio. K'é is a space to support the growth, development and capacity building of small businesses. It is located at 126 West Main Street in downtown Mesa, Arizona. It is founded by author and small business coach Pamela Slim. K'é (pronounced "keh") is a Diné (Navajo) word, meaning "system of kinship." It is the feeling you have when you are deeply connected to others, and understand and value your roots. Pam chose the name K'é as a reflection of her husband and children's culture, and as a reinforcement of her personal value of treating all community members as extended family. The mission of K'é is to develop the skills, strengths, visibility and leadership capacity of small business owners in Mesa, and the broader Phoenix small business community. Pam will also continue to serve her large small business community around the world, through virtual classes, digital products and live streamed events at K'é. Downtown Mesa is undergoing tremendous positive change. There is a large and vibrant small business community, and loads of creative talent in the city. The first phase of the Light Rail project is now complete. There are plans underway for ArtLofts Mesa, and an ASU campus in 2017. But unlike many of our sister cities like Chandler, Gilbert, Phoenix and Tempe, we do not have the support, investment and mentoring required to maximize the potential of our small business community. By creating a space right in the heart of downtown, we can invite the best local and national experts, as well as cultivate our Mesa expert community. When does K'é open for business? Regular events and classes will start on September 1, 2016. Pam is so excited to meet you and show you the new space! Pam at ﻿Volstead Public House, ﻿ imagining how much fun she will have with fellow business ﻿owners in Mesa! Photo by Kelly and Sergio. Pamela Slim is an award-winning author, speaker and small business coach. She is celebrating her 20th year in business in 2016. A former Director of Training and Development at Barclays Global Investors in San Francisco, she spent the first 9 years of her business as a consultant to large companies such as Hewlett-Packard, Charles Schwab and Cisco Systems, where she worked with thousands of executives, managers and employees. In the last 11 years, she worked hands-on with hundreds of people to start and grow successful businesses. She built a powerful online presence at Escape from Cubicle Nation, a site de​signed for corporate employees who wanted to make the shift to entrepreneur. At Escape, Pam developed and taught business building courses for tens of thousands of entrepreneurs. Pam has worked with companies serving the small business market like Infusionsoft and Citrix. She is a new Advisor to Hopscratch. Pam's first book Escape from Cubicle Nation (Penguin/Portfolio) won Best Small Business/Entrepreneur Book of 2009 from 800 CEO Read. Her second book Body of Work (Penguin/Portfolio) came out in 2014. Pam has lived in East Mesa for 14 years. She will never leave. Through our Indiegogo campaign (ends on July 10! ), we have received encouragement and support from around the globe. We will use funds raised to create a warm, welcoming and comfortable learning space. If you want to help accelerate the growth of downtown Mesa, click here! Is K'é a coworking space? What are your first year goals? We aim to reach 5,000 small business owners in our first year in operation, through a combination of live classes, events and workshops in the space, as well as virtual classes.